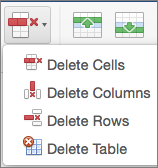 You can use the Insert commands in the Layout tab to manage the rows and columns in tables. You can add a row above or below the cursor position. Click where you want in your table to add a row or column and then click the Layout tab (this is the tab next to the Table Design tab on the ribbon). To add rows, click Insert Above or Insert Below and to add columns, click Insert Left or Insert Right. Tip: To add a row at the end of a table, click the last cell of the last row, and then press the TAB key. Click a row or cell in the table, and then click the Layout tab (this is the tab next to the Table Design tab on the ribbon). Click Delete, and then click the option your need in the menu. Note: The option to delete the table on the Delete menu is only in Word. If you want to delete a table in PowerPoint, select and delete it. Click where you want to add a row, and then click the Table Layout tab. Under Rows & Columns, click Above or Below. You can also use the Draw tool to draw a row in a selected table. On the Tables tab, under Draw Borders, click Draw, and then draw a line through a row. To add a row at the end of a table, click the last cell of the last row, and then press the TAB key. Click a row or cell in the table, and then click the Table Layout tab. Under Rows & Columns, click Delete, and then click Delete Rows. Click a column or cell in the table, and then click the Table Layout tab. Under Rows & Columns, click Left or Right. Under Rows & Columns, click Delete, and then click Delete Columns.